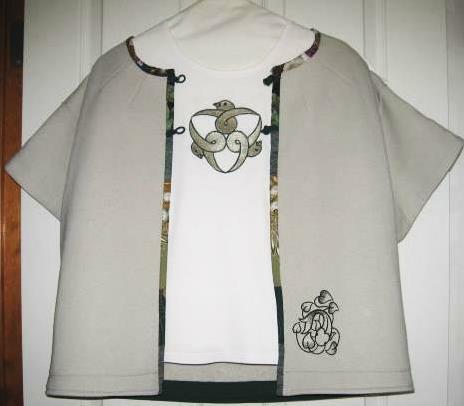 Avis writes, "I had so much fun creating this jacket that I'd like to share its story with you. 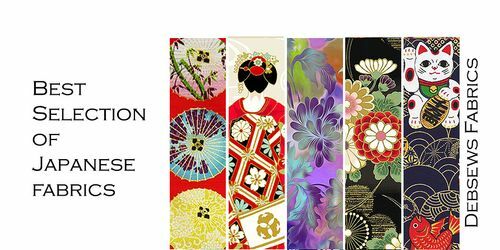 I am fond of the online shop debsews2.com that specializes in Asian print Kona quilting cotton. Whenever I buy a yard or two of fabric, the owner includes several sample 4" squares of fabric. I've quite a stash of these little gems. I also had a new khaki sweatshirt that had a defect on one of the sleeves, some dark green quilt binding and dark green 1/8" cord. I lopped off the lower sleeves of the sweatshirt and removed both the neckline and bottom bands. To add shape, I made radiating darts in the neckline, front and back. I chose print squares that went well with khaki and sewed them into strips for binding. There was enough binding to go around the neck and down the front. I faced the hem and sleeves with the green quilt binding. The jacket needed some sort of closure, so I used the green cord to crochet knots and loops that closely resemble frogs."